With the number of entry-level sports and entertainment marketing jobs listed on job boards these days, you would think that either college students interested in sports and entertainment marketing are in short supply or that our entire economy is based on leisure activities. Hopefully, you know that both of those explanations are preposterous, so what gives? The true story is that real sports and entertainment marketing jobs are extremely hard to come by and in very high demand. Most of the job postings that you will find in these fields are posted by companies who are using a very loose interpretation of the terms "sports marketing" and "entertainment marketing" to attract the eyes of wet behind the ears college students. When I think of sports or entertainment marketing, I think of working on corporate sponsorships of events or endorsement deals. I don't think of going door to door selling books of coupons for a dollar off of a hot dog at a Dodgers game. ***IMMEDIATE HIRE*** Work With PRO Sports! We Will Train! Start Your Career in Sports and Entertainment Marketing!!! Who wouldn't get excited and click on job postings with titles like those? I first encountered some of these scams when I was job searching after I graduated from college. They got my hopes up with really catchy headlines, but I quickly became wise to the fact that these weren't real jobs. I had almost forgotten about these scams until my friend's little brother asked me to help him find an internship. He was a freshman, so it was understandable that he had waited a bit too long to begin his internship search. He told me that he had come across a really great looking internship posting and that both he and his friend (also a freshman) had already landed phone interviews based on their resumes alone. This was warning sign number one. Two freshmen who are looking for internships in May both get interviews. It's possible but unusual. I did a little research for my friend's brother and quickly realized that everyone makes it to the second round interview. If you send a resume, they will give you an interview. If you're able to answer the phone for your phone interview, you'll land an in-person interview, and that's where the fun begins. You'll probably show up for your in-person interview in your Sunday best. There's a good chance that it will be your first job interview ever. You'll be nervous, but excited. Then you'll realize that this isn't an interview at all. 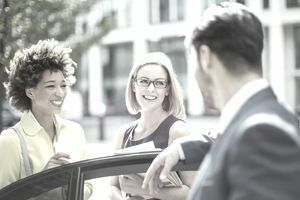 You'll be expected to get into a car with a current employee (usually the car doesn't look fit for the road), and you'll drive to a neighborhood that could be as far away as a couple hours' drive. Your "interviewer" will tell you to take one side of the street while he or she takes the other side, and you'll start selling coupons door to door. The coupons often have something to do with major sports teams or entertainment venues. That's why they advertise the jobs with the words "sports and entertainment marketing." If you ask to be taken back to the office, you'll have a mixed chance of having the person actually agree to return you to the office. If you go through with the "interview" you could end up in some scary situations. There have reports of "interviewees" having guns brandished at them and being stranded many miles from home. There's no sense in putting yourself through a situation like this. Even if your parents want you to stick it out since it's your first interview, be firm, say no, and put your time to use searching for an entry-level job or internship that will actually help you accomplish your career goals. I convinced my friend's brother not to interview with the company in question, and then I exposed these types of operations in posts about on my sites One Day, One Job and One Day, One Internship. Since those posts were published, I've saved dozens of people from enduring the "hiring process" with companies that use these tactics. Many people would argue that operations like the ones that I've just described aren't scams. If you define a scam as someone who takes your money and doesn't give you what you expected, then these job opportunities aren't technically scams; however, they do give you one impression of how you'll be spending your time and offer a completely different experience. At the very best, these companies are dishonest and sleazy. At the worst, they can put your safety at risk. You can make money in these opportunities, and you can advance to management quickly if you're willing to swindle other people into working for you in one of these jobs, but they're not what they're advertised to be by any means. Do you trust major job boards to protect you from scams like these? You shouldn't! Many major job boards take money to post jobs by companies, despite the fact that these companies use shady practices to trick unwitting college students into applying and "interviewing" for their jobs. When you're job searching, you need to be wary. Now that you know what's up with these "jobs," here are some warning signs to look out for when scanning job boards. How can candidates avoid these jobs without passing up viable opportunities to launch their career in marketing? One strategy is to search company websites for the more detailed descriptions of positions which sometimes exist online. Another safeguard, when contacted for an interview, is to ask questions about the exact nature of the job duties. If notified by email, ask for a brief telephone consultation to learn more about the job before proceeding with a formal interview. If employers are reticent to elaborate, then a red flag should go up in your mind. What are the typical tasks associated with the job? What training would you receive? What is the nature (not amount) of compensation if the job is sales oriented i.e. what percentage of the compensation is a commission? Employers who will be paid solely with commission have a low level of investment in candidates and often have a revolving door. If the job is sales oriented ask how leads are generated and make sure you are comfortable with that process. Some of these "marketing" jobs involve heavy cold calling, door to door sales, and/or soliciting your family and friends. Look extra carefully at any jobs in Sales, Marketing, Sports Marketing, or Entertainment Marketing. There are plenty of legitimate jobs in these fields, but the scams tend to be focused on these areas. If the interview process seems a little bit too easy, there might be a reason why. Start asking direct questions to figure out what the company and jobs are really about. Just walk away if your interviewer tells you, "You'll just have to see it to believe it" when you ask what you would be doing in the job. Use the power of Google as a job search tool to research any companies that you're thinking about applying to. Willy Franzen specializes in Human Resources and is a founder at One Day, One Job, a job search site.